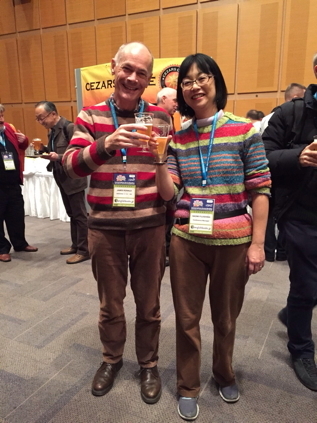 Jim: Hello Naomi, long-time friend, long-time fellow LD-SIG member, with lots of shared or complementary interests in learner development and beyond… But in fact, we rarely get to speak about these things, do we? In fact, I think that we probably talk about food more than anything else! So I’m really looking forward to talking together about various language learning related matters over this year through Talking Points. And I really hope that the topics we pick up will be of interest to other LD-SIG members, and that the conversations may continue, through the blog entry comments, maybe at local LD Get-togethers, or in our own minds. Naomi: Thanks, Jim, for asking me to join you for this Talking Points column. I’m looking forward to working with you this year. I’m not one to talk very much, so I hope this column will help me become more articulate. I consider myself more of a listener/observer rather than the outspoken type, so I’m looking forward to learning a lot from you! Naomi: I don’t know if I know more than you do, but I can tell you that a social learning space is basically a place where learners can come together in order to learn with and from each other (Murray, Fujishima, and Uzuka 2014). Together with my colleague, Garold Murray, who is the one who heads our research on the L-café at Okayama University, we see a social learning space as a place that is not regulated by rules and policies, such as a university classroom where students are required to attend in order to gain credit for graduation. Students can come and go as they please, and do what they want. At the L-café, students stop by whenever they don’t have a class to attend. They meet their friends, have lunch, and chat. They can speak in whatever language they feel comfortable with or whatever language they are interested in learning. 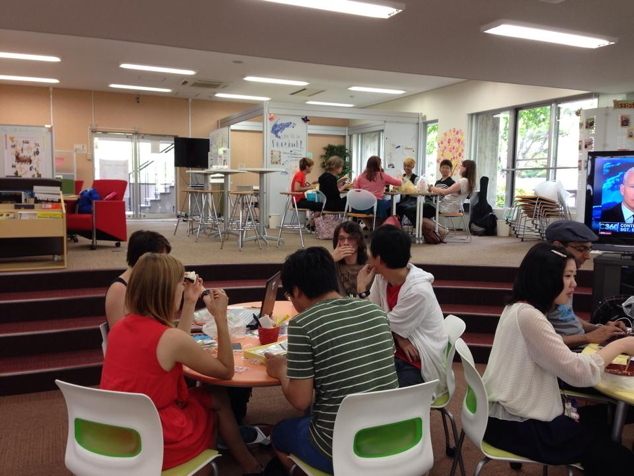 For most of the Japanese students, it’s a place to make friends and practice their English (or another foreign language, such as Korean, Chinese, German, or French), and for most of the international students, somewhere to practice their Japanese language skills. Jim: I really like that definition – “a place where learners can come together in order to learn with and from each other”. This is a good reminder that autonomous learning is very often not only isolated individual learning. I’ve visited your L-café once, and was really impressed by what I saw. 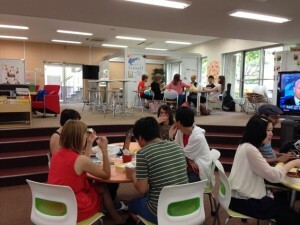 In fact, at my university in Hiroshima we’re planning to start one of those (probably i-café!) from April and we do need to know how to make it work. We don’t want it to end up as an empty room, and we don’t want it just to end up as another lounge with no foreign language learning or using going on. Jim: I think that ours will probably be similar. We have quite a lot of international students but we still haven’t quite worked out how it will work for them, because they need to have a reason for going there. It could be like a part-time job, but they also need a reason, maybe a language-based reason. We’ll need to work that out. I’ve a couple of ideas. Anyway, you also have Japanese students who help out, don’t you? Naomi: Well, when we first started, we had an English table, and there was a little sign saying “English conversation”, so when you sat at that table you had to speak English. 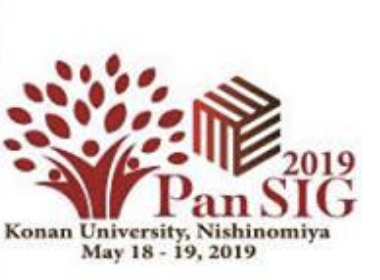 We did have some student workers who were hired to help Japanese students, and these were not only international students but also Japanese students who had studied abroad and were very good at English. And there are various lessons taught at the café. 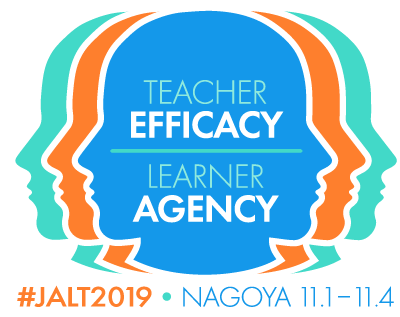 Naomi: Yes, most of the TOEFL prep courses are taught by Japanese students who have had experience of taking the TOEFL, unlike the international students who don’t know about TOEFL. These are not credit-bearing lessons, so they’re more relaxed and, with the teachers closer to their age, they seem to be really popular. Jim: What impressed me was that, from the time we entered the L-café, there were students waiting to welcome us, to draw us in, and that was really impressive. It’s really easy to overlook that type of thing. You have to stop and think how to help get students who want to come in get over their hesitation to come in. Naomi: Yes, that’s one of the duties of the, we call them assistant managers, the student workers. To always be alert, and if there was a student coming in, to make sure they’re welcomed, and to help them as much as they can. Jim: How is a social learning space different from a SAC/SALC? Is there less of a focus on resources? Naomi: Well, with us, like a self-access center, the learning materials are there but in a social learning space that’s not the number one priority. Basically, the main purpose is for them to be able to meet friends, and to make friends. There are no restrictions that you have to watch a DVD or go look at the graded readers. Jim: And it’s true, it’s a different culture, and I think that you have to do a lot of things here to pave the way, to enable students to do what they only half realize is in their interest to do. I think that the experience of being involved in it kind of opens up their eyes to the value of it, and until they’ve done it, maybe the best we can hope for in many cases is a kind of grudging, “Well, okay, I’ll go along and see what it is”. Naomi: Yeah, exactly. So what’s the idea you have for your i-café? Naomi: Yeah, well, all the best – and tell me how it goes! Murray, G., Fujishima, N., & Uzuka, M. (2014). The semiotics of place: Autonomy and space. In G. Murray (Ed.) Social dimensions of autonomy in language learning (pp. 81-99). New York: Palgrave Macmillan.